Red and the crew find themselves embroiled in a civil war for merchandise rights and are forced to side with either the ghastly, disgusting, nine-foot-tall shambling insects, or the bad guys. Will our heroes keep their spirits up and their bile down long enough to save the day? Writer/director Rob Noyes' vision of the World of Tomorrow. Not the bleak, post-nuclear wasteland or industrial urban dystopia of 1980s science-fiction, but the clean, modernist utopia imagined by the 1939 World's Fair: a future which, through industry and hard work, promised to be streamlined, prosperous and bright; and beyond it lay the Cosmos, just waiting for exploration and colonization. Red Shift and Lumpy lived in just this kind of Universe, and Dr. Alberts and Penny Parker were keen to travel there. It turned out, however, to be just slightly off-center from what they were expecting. Lauren Robinson ..... Melvin / T.C. Nine years after the first atomic bomb was detonated near Alamogordo, New Mexico, a mute little girl found wandering the desert heralds a series of mysterious disappearances. Local authorities are stumped until an eccentric scientist from Washington arrives with his daughter to aid in the investigation. But what they uncover is so fantastic and so horrendous that news of their discovery could cause a nationwide panic! 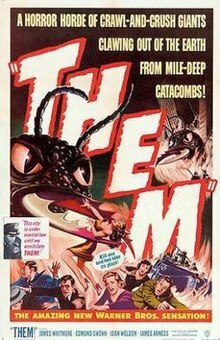 Adapted by PMRP Artistic Director Neil Marsh from the classic 1954 big-bug film by Ted Sherdeman, Russell Hughes & George Worthing Yates (story).